Our National Parks are outstanding representatives of natural landscapes that are established to protect habitats, wildlife, and ecosystem diversity – which may be unique to specific natural regions across Canada. Therefore it is only fitting that when BIO set out to ‘barcode our country’s backyard’, collecting from Canadian National Parks was on top of the list. 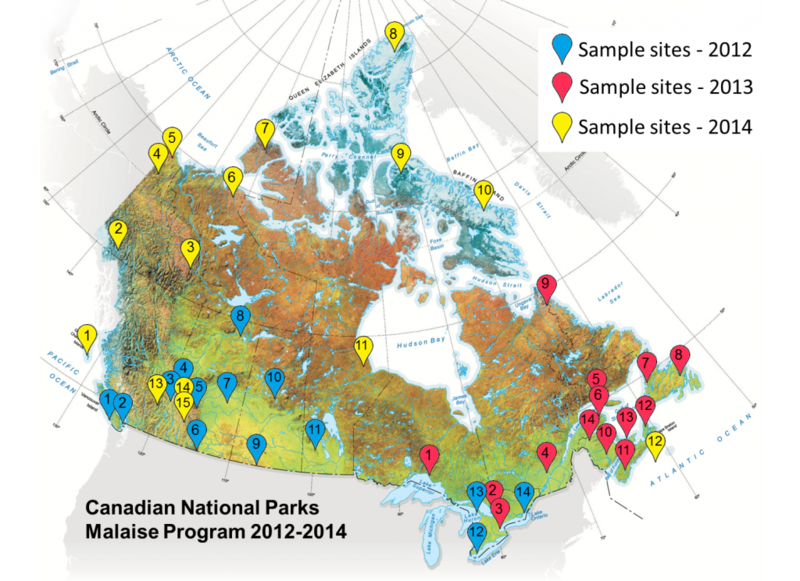 As of October 2014, BIO has sampled 43 of 45 of Canada’s National Parks. The Canadian National Parks (CNP) Malaise Program involved Malaise trapping all across Canada starting with the western region in 2012, next with the eastern region in 2013, and finally completing the list with Canada’s northern and remote parks in 2014. We’ve collaborated with Parks Canada whose staff facilitated the program by servicing our Malaise traps for as little as 1 week to as long as 20 weeks during the summer months. This program provides us with a vast collection of arthropods from every single province and territory in Canada. We’re expecting to find great differences in species biodiversity from the mountains to prairies to boreal forests and coastal regions; and especially to Canada’s northern glaciers. 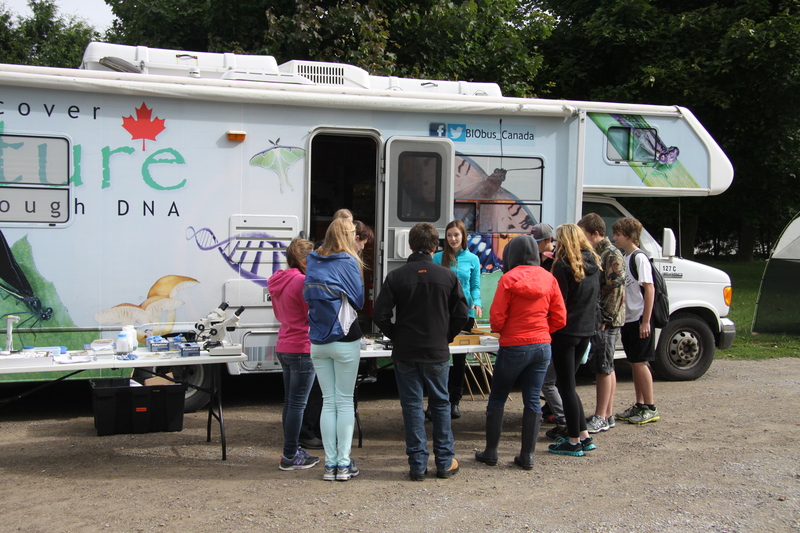 The BIObus has also travelled to many of these parks, 23 to be exact, where BIO staff and undergraduate students perform more comprehensive arthropod sampling (http://biobus.ca/maps/). Using techniques like sweep netting, Berlese funnels, and pitfall traps, we collect arthropods that may not have otherwise been captured using only Malaise traps. The BIObus crew gets to visit at least four National Parks during their 5-8 week-long portions on the bus and blog about the great scenery and diverse wildlife they see across our country. Of course, being the second largest country in the world (with an area of almost 10 million square km), there are many more natural regions that we have yet to collect in. 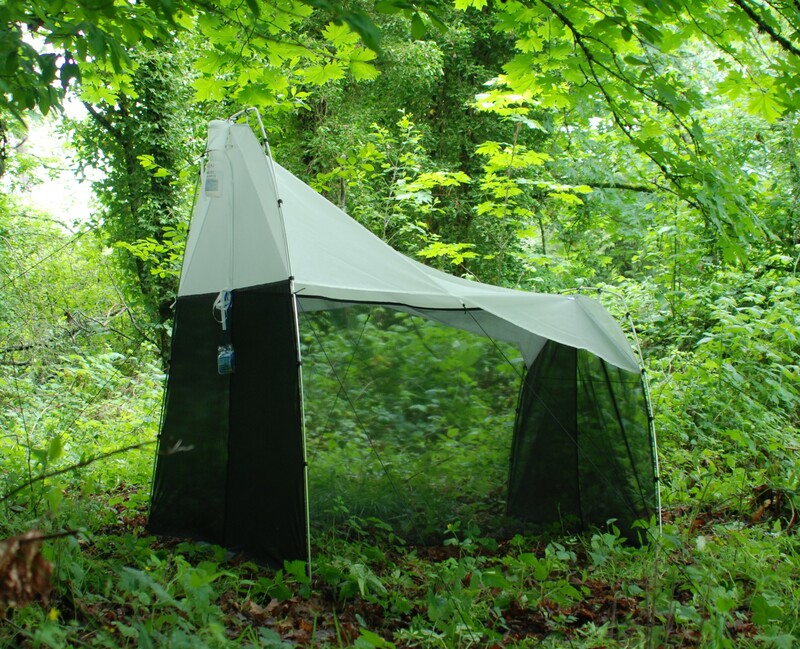 This year, BIO also focused Malaise trap efforts in provincial parks in British Columbia and Southern Ontario (http://biobus.ca/catch-this-at-a-park-near-you-the-ontario-malaise-program/). The sum of all these projects will contribute to the overall map of terrestrial arthropod biodiversity that BIO is working towards in the Barcoding Canada Initiative. Having collected from all of Canada’s provinces and territories, and now in nearly every national park, you could say that BIO is well on the way to barcoding Canada’s collective backyard. 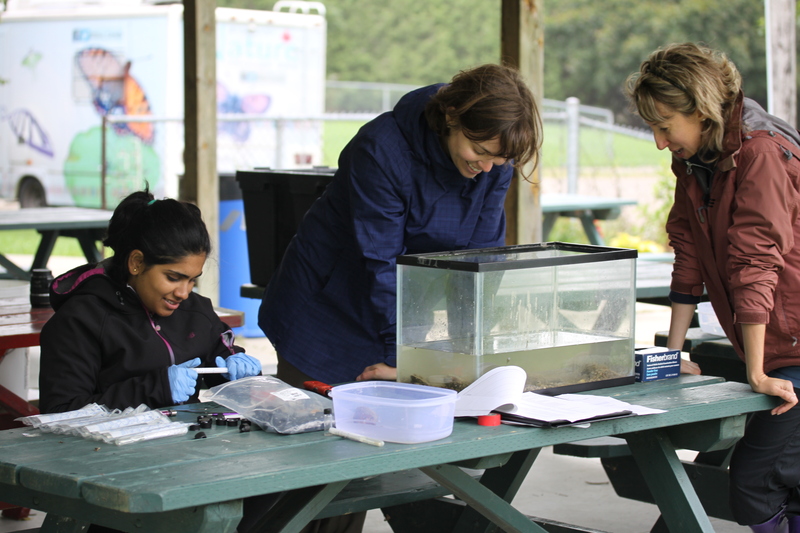 On September 12, a few of us from BIO teamed up with the Ausable-Bayfield Conservation Authority (ABCA) for their ‘Mussels and Muffins’ event in Ailsa Craig. A number of ABCA biologists including Hope Brock and Kari Jean, organized and led a fantastic outreach event for a large group of local high school students and community members. The BIObus had one of the four stations that the participants cycled through, all concentrating on mussels, local biodiversity, and the human impacts on both. A highlight for us, and many of the students, was learning of the incredible life cycle of snuffbox mussel (Epioblasma triquetra) that involves luring and clamping onto the common logperch (Percina caprodes) to disperse glochidia larvae into their gills — a fact we will not soon forget thanks to Hope’s puppet show! BIO has also partnered up with Hope and Kari from ABCA on an exciting new research project. 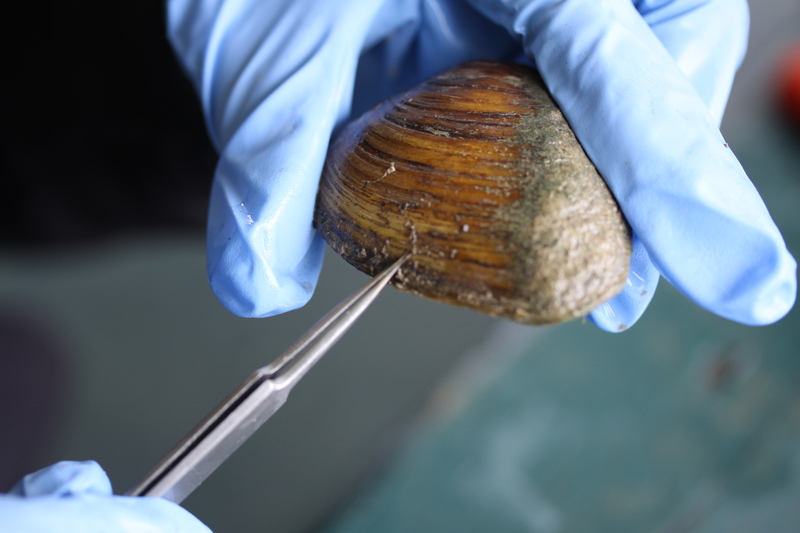 Undergraduate student Kareina D’Souza is working on a project to barcode Canada’s freshwater mollusks, particularly unionid mussels and physid snails. Her project will focus on species of conservation concern, and non-invasive methods to monitor their populations. Some day it should be possible to test a water sample from the Ausable River for the presence of particular species at risk, or even detect invasive species, using species-specific probes or sequencing the environmental DNA in that sample (see examples of ‘e-DNA’ studies here or here). But this won’t be possible until the DNA barcode library is constructed, and that’s what Kareina is working on, and where ABCA comes in. We’re working with Hope and Kari to sample the mussel species in their watershed, as well as field test a non-invasive sampling protocol that Kareina and BIO’s Kara Layton are working on. It was a successful day on both fronts — 23 individuals from 6 species were sampled, and a few kinks in the protocol were identified. In a few weeks time, we’ll know if the samples taken will successfully produce DNA barcodes, but just like our ‘mussels and muffins’ day with ABCA, we’re expecting it to work out perfectly. Kareina, Hope and Kari work through the tank of mussels from the Ausable River, sampling tissue for molecular work.